The aim of this study is to evaluate the clinical outcome of single-incision flexor hallucis longus tendon transfer in chronic Achilles tendon rupture. 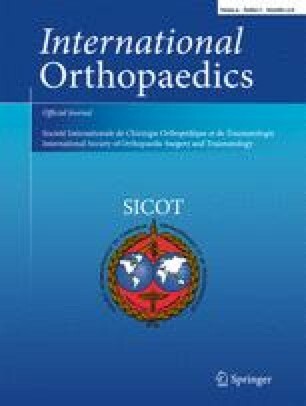 A prospective study of a series of cases of chronic Achilles tendon rupture that were treated with single-incision flexor hallucis longus tendon transfer, from April 2015 to December 2016. The study included 21 patients (15 men and 6 women), with mean age 40.3 ± 17.5 years. The average follow-up time was 15 (12–24) months. Flexor hallucis longus transfer was fixed with a titanium interference screw in an intraosseous calcaneal tunnel. The average operative time was 52.9 ± 8.7 minutes. The AOFAS-hindfoot score was significantly improved from the mean pre-operative value of 57.4 ± 10.3 to mean value of 95.3 ± 4.4 (p value < 0.001). There was no effect on the big toe function. The complication recorded was one superficial wound infection which resolved by dressing and appropriate antibiotic coverage. All patients were satisfied with the results of surgery. Single-incision flexor hallucis longus transfer for chronic Achilles tendon ruptures is a simple method with minimal morbidity and complications. The technique resulted in great patients’ satisfaction as well as excellent functional and clinical outcomes.